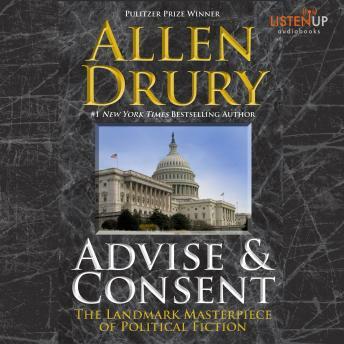 Pulitzer Price winning Allen Drury has penetrated the world's stormiest political battleground-the smoke-filled committee rooms of the United States Senate-to reveal the bitter conflicts set in motion when the President calls upon the Senate to confirm his controversial choice for Secretary of State. This novel is a true epic showing in fascinating detail the minds and motives of the statesmen, the opportunists, the idealists. From a Senate old-timer's wily maneuvers, a vicious demagogue's blistering smear campaign, the ugly personal jealousies that turn a highly qualified candidate into a public spectacle, to the tragic martyrdom of a presidential aspirant who refuses to sacrifice his principles for his career-never has there been a more revealing picture of Washington's intricate political, diplomatic, and social worlds. Advise and Consent won the Pulitzer Prize for Fiction and stayed on the New York Times Best-Sellers List for 102 weeks. It is a timeless story with clear echoes of today's headlines.